MOUNT PLEASANT, MICH.—Following four months of negotiations, Central Michigan University and the American Federation of Teachers have agreed on which nontenure-track faculty members will be recognized as members of a potential new bargaining unit. The adjunct faculty and their supporters, who had planned a protest rally for today, will still hold a rally at 11 o’clock this morning near the library on the Mount Pleasant campus to celebrate the agreement. Under the agreement, nontenure-track faculty who teach quarter time or more, with some exceptions, are eligible for representation. CMU was notified in early March by the Michigan Employment Relations Commission that nontenure-track faculty had filed for union certification. “We are ecstatic about the opportunity to vote for union representation, and we look forward to a collaborative relationship with President Ross and the CMU administration,” said Mary Ann Freling, an adjunct professor who has worked for two decades in the English department. A unionization vote will be scheduled as the next step in the process. CMU will withdraw its request with MERC for a hearing on the matter. Across Michigan, thousands of nontenure-track faculty have formed unions or are in the process of doing so, including faculty at the University of Michigan, Ferris State University, Henry Ford Community College, Wayne State University, Michigan State University, Eastern Michigan University and Western Michigan University. Are you a full- or part-time non-tenure-track faculty member who is tired of being marginalized by the institutions you serve? Are you dismayed by the working conditions and lack of academic freedom protections that come with being hired on a contingent status? Are you concerned about what the corporatization of the university is doing to the teaching profession and to students' learning conditions? I am. That's why I'll be joining hundreds of my colleagues from the United States, Canada, and Mexico at the ninth conference of the Coalition of Contingent Academic Labor (COCAL), in Quebec City, August 13–15, 2010. The conference is run by contingent faculty activists and will feature practical workshops and sessions on topics including the following. Leaders of major higher education unions will participate in the conference, both to discuss their views on prospects for improving conditions for contingent faculty, and to hear your views on the subject. Plenary speakers will include Cary Nelson, president of the AAUP, as well as leaders of the National Education Association, the American Federation of Teachers, and major Canadian and Mexican faculty unions. Included in the price of registration are a cocktail hour and supper, a bus tour of Old Quebec City, an outdoor multimedia show, and a dinner cruise on the Saint Lawrence River. Take advantage of the down time to enjoy beautiful Quebec and continue the day's discussions with your fellow activists. Register for the conference or learn more. Early registration rates end July 2. Learn about the AAUP's work on issues affecting contingent faculty. COCAL Conferences are held every other year, usually alternating between the United States and Canada. Conferences feature simultaneous translation into English, French, and Spanish. Accommodations will be available in student residences or nearby hotels. Be part of an international movement to save higher education and the academic profession. Join us at the Université Laval in Quebec City for COCAL IX, August 13–15. Have you written on behalf of the EWU adjuncts yet? Whether or not you have, feel free to make use of the following NFM press release addressing East-West University's recent mass abrogation of adjunct summer contracts. Join us in denouncing and deploring) ~ blog, tweet, forward, distribute to mailing lists, send to college press and local newspapers, social media, etc. Akron, Ohio – New Faculty Majority: The National Coalition for Adjunct & Contingent Equity faxed a letter today to East-West University Chancellor, Dr. Mohammad Wasiullah Kahn, condemning the Chicago area university's mass firing of its adjunct faculty and urging him to restore their contracts. This letter was also copied to U.S. Secretary of Labor Hilda Solis and U.S. Secretary of Education Arne Duncan. East-West University is a private university which this month faced the prospect of faculty unionization after the Illinois Education Association (IEA) filed a petition seeking an election to represent part-time faculty. In an unprecedented act of union-busting, East-West University announced that it would not hire any contingent faculty for the summer term, effectively making them ineligible to participate in the election. The university also announced that prior to being rehired in the fall, contingent faculty members would be required to interview with the Chancellor. New Faculty Majority calls this abominable action for what it is: a clear attempt to squelch free speech and to retaliate against those who contributed to the unionization effort. The University's claims that its decisions are based on factors unrelated to the union drive are disingenuous at best and a clear pretext for union-busting at worst. On even the most casual review they suggest the possibility of illegal activity. NFM calls on Illinois lawmakers and the Departments of Labor and Education to investigate the University's actions in order to protect the rights of its faculty and to send a strong message to other higher education institutions that such actions will not be tolerated. In its letter, NFM reminds the Chancellor that efforts to secure collective bargaining efforts are fully protected under Section 7 of the National Labor Relations Act as "concerted activity for mutual aid and protection" (29 U.S.C. 157). NFM also points out that this principle is recognized universally, including by the Unitied Nations in its Universal Declaration of Human Rights: "Everyone has the right to form and to join trade unions for the protection of his interests" (Article 23.4). Over seventy percent of the faculty at East-West University are on contingent appointments. This classification means that they are part-time or adjunct faculty whose employment depends entirely upon such factors as enrollment, funding, and, in the absence of collective bargaining, arbitrary decisions by administrators, thus jeopardizing their academic freedom and making them particularly vulnerable to this sort of retaliatory action. This is a growing trend on American college and university campuses, where institutions of higher education have become increasingly reliant on overworked and underpaid contingent faculty. New Faculty Majority has emerged as an advocacy group working on behalf of adjunct and contingent faculty on American college and university campuses with membership in nearly every state in the country. As a coalition that includes union members and nonmembers, NFM is working with all organizations and individuals committed to improving the quality of American higher education by treating all of its faculty with dignity and fairness. The United Adjunct Faculty Association (UAFA) at East-West University (EWU) remains determined to fight for its right to organize a labor union for its members. Many of you may have heard that EWU administration has offered an in increase in pay for adjuncts beginnning fall 2010. An adjunct professor with a M.A. will receive a 13% pay increase and one with a Ph.D will receive a 20% increase per 4 credit hour class with 35-42 students. To this present day, all the 8 fired adjuncts have not been rehired. As one of the fired adjuncts, I will tell you that I will not give up on this struggle. We all want our jobs back! Even in the face of financial difficulty and economic uncertainty, many UAFA members are pressing forward to bring fundamental change for the largest workforce at EWU: the adjunct faculty. Most of the fired adjuncts are filing for unemployment compensation. EWU administration has a long history of fighting against paying its adjuncts unemployment compensation. UAFA is meeting on Monday, June 28th afternoon in the Illinois Education Association office at 230 West Monroe Suite 2640 located in downtown Chicago from 4-6PM to strategize on our next move. A few of you may know that I have been working on a book idea. The working title is We're Taking it Back: Contingent Faculty Researching Contingent Faculty, and I have volunteered to be one of the editors. I have one chapter written on evaluation practices, another possible author has suggested a chapter on teaching online (this could be its own section.) Maybe you have a paper ready to go, or maybe just an idea. In terms of word count I was initially thinking between 5,000-10,000 words. If anyone is interested in being a co-editor let me know. Someone has semi-formally volunteered to write a forward. We also have some people who may help us with finding a publisher. This might not make much if any money in the long term, but any profits will be set up to go directly to The New Faculty Majority. If you have a chapter idea please send me an abstract of 500 words or less with an initial abstract deadline of August 2, but sooner is better than later. Manuscript deadlines will be arranged at a later date. The impetus to the book directly results forom the numerous studies and research taking place around the country about us by paid research firms, adminstrations, and others; as a result, I felt strongly that our voices should be heard from as well. Many of the people on this listserv have conducted such research, and are in the process, so let's collect some. Previously published work will definitely be considered, if it is copyright feasible naturally. So what do you say? Send in those abstracts, and let's build a book of our own. For those who prefer snail mail, write me at"
Wayne State (UPTF), Chicago COCAL and other adjuncts are somewhere in the marching crowd at the US Social Forum Opening Day March. Raye Robertson (The Adjunct Voice) and NFM board member Jen Bills are in there too. Are you? Let us know. Tell us about it. If you haven't already, read Scott Jaschik's Inside Higher Ed article, Adjuncts and Retention Rates, on the Jaeger and Eagan study, Examining Retention and Contingent Faculty Use in a State System of Public Higher Education, now, before reading further. In many cases, state systems of higher education are not only challenged to address decreasing state budgets but are also asked to increase student retention and other measures of student success. The increased use of contingent faculty may help economically, but this trend may have unintended consequences. This research used logistic regression methods to examine six institutions within a public higher education system for the effects of contingent faculty use on first-year student retention. A thorough examination of other traditional variables used in retention studies is also provided. Results are reported by institutional type via Carnegie classification. Most notably, high levels of exposure to part-time faculty in the first year of college are consistently found to negatively affect student retention to the second year. These findings have implications for both policy and practice in the use of contingent faculty across institutional types. We think the most obvious positive is the study's finding (unsurprising to us) that better support for adjuncts translates into better outcomes for students. But we also would have liked to see if "support" for adjuncts included such things as access to benefits and decent compensation relative to that of contingent faculty in other places (not to mention relative to the tenure-stream colleagues with whom contingent faculty are being compared to in other respects); union representation; and participation in governance, in addition to things like inclusion in orientation. Conversely, in places where there was apparently a "negative effect," were these factors considered? Other positives are the report's acknowledgment of the limitations of this and past studies; its recognition of the need for more and better research that teases out the factors that constitute educational quality and/or contribute to student retention; and its highlighting the fact that institutions are not required to keep or report the kinds of statistics on such crucial issues as part-time faculty longevity or motivation or the teaching methods they use -- and, again, we might add compensation or inclusion in governance or union representation -- that would be helpful to better research. So with any luck the publication of this report might lead to better recordkeeping and research. The most hopeful part of the report may be in its conclusion, again completely unsurprising to us, that it is imperative that we improve our understanding of part-time faculty, which includes the needs and desires of this group. The hint of respect for contingent faculty that finally comes through in this sentence at the end of the report is a welcome contrast to its (and previous studies') persistently dehumanizing attitude toward us, created by language like "exposure" and "use" and stated assumptions on contingent/student interactions. All of that contributes in its own way to perpetuating a culture that is unsupportive of contingent faculty. But, provided its findings are closely examined and limitations properly appreciated, this report does contribute to the effort to improve undergraduate education through the improvement of working conditions for the majority of faculty directly responsible for it. Ed note: comments on this article within the NFM email group have been lively and thoughtful. I hope that other board members will share them here. I'm thinking of Steve Street in particular and am willing to nudge hard (e.g. nag) for them. East-West University's Chicago shenanigans, our own Unemployment Comp Initiative, US Social Forum (including but not limited to Adjuncts United at the opening day march and "voices for the voiceless" workshop) and are all necessary by-products of / reactions to living la vida precaria in Temp Nation. No study or academic press articles needed to figure that one out. "Lived experience" (Raymond Williams) suffices. Not academia but relevant: Temp Nation, a four-part Global Post series on the structural changes taking place in Japan, the world's second-largest economy. With the demise of Japan, Inc.'s lifetime employment policies [cf tenure], more than a third of the country's workforce is now underworked and underpaid. This series examines how some temps are starting to fight back. It also investigates the impact on foreign workers, and the political response to this growing social and economic problem. 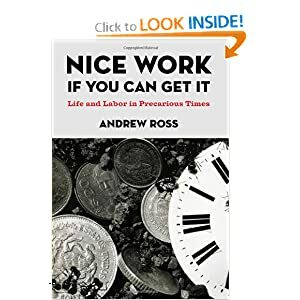 Times Higher Education reviews Nice Work If You Can Get It: Life and Labor in Precarious Times, which includes chapters on precarity in the university. Excerpts are also available on Google Books. alumni and the University Board of Trustees would not want to see the institution shrouded in a public fight which could tarnish prospective students' views about attending EWU. What could be the reason for the ongoing practices by the Chancellor and Provost? Could it be related to the recent effort by UAFA to form a labor union at EWU? The facts show that several adjunct faculty members were notified by their Department Chairperson that their summer class assignments had been revoked on the afternoon of June 9, 2010, the very day UAFA withdrew its petition with the National Labor Relations Board for collective bargaining. UAFA members have not had one single pay increase in over 6 years! UAFA calls on full-time faculty members to take a public stand and voice support for the reinstatement of former adjunct faculty members whose commitment to students is undeniable. Frankly, this public protest is quite painful, but it is necessary if the university is to move forward in its accreditation, building construction and treatment of its current adjunct faculty. UAFA and former adjunct faculty are aggrieved by the recent chain of events. We hope this crisis can be resolved without another public protest which will include the mobilization of students, parents, alumni, supportive colleagues from across the city of Chicago and the media. Our protest comes with the core belief that East-West University can fulfill its mission of treating its students and adjunct faculty in particular with fairness and nondiscriminatory practices. UAFA members with assigned classes wish to remain anonymous due to the very vulnerable status they occupy at the university. It is our hope that the Chancellor and Provost will embrace justice. Please find below the message just sent to the Chicago COCAL list. Send your protests to the administrators listed and pass this message on, especially to anyone you know in the Chicago area who might come to the picket, but also to people who can send protests or statements of support. Also forward to organizations for statements of support. More information will be forthcoming. Adjunct faculty at East-West University in downtown Chicago are planning a picket line to protest the non-rehiring of several (including the leader of the United Adjunct Faculty Association, IEA/NEA) faculty for both summer and fall terms. All but one of these are people who recently signed union authorization cards calling for a Labor Board election. As the press release (to be posted separately) and the Inside Higher Ed story make clear, the administration is trying to forestall unionization by essentially firing the entire faculty then hiring them back selectively after personal one-on-one interviews with the Chancellor. This is happening at a school with a mostly African-American and other minorities faculty and student body and where the vast majority of students are on Federal financial aid. Please come out to the picket TOMORROW morning if at all possible and support our brave adjunct colleagues in this private college. Take a sick day if you have to, but come and bring others. If this tactic of firing a whole faculty to avoid unionization is allowed to stand, it could threaten all future organizing and even existing unions. If you ever wanted to do something concrete for the contingent faculty movement, this is the time! I can't say for sure just how much this particular campaign addresses adjunct and contingent faculty issues. Read the AAUP and decide for yourself. If you think it is lacking, write the AAUP and let them know. Some time back there was word in adcon circles about a letter writing campaign asking for equity language in the higher funding bill. Haven't heard any lately, but would it hurt to ask? Needless to say, if you prefer emailing to telephoning, you can adapt the phone script in the Government Relations section - or write your own script for phone or email. Put an ad/con spin on your appeal. As the economic crisis continues to threaten all of our nation's institutions, the AAUP is the ONLY national faculty organization pushing to restore funding for higher education faculty and staff in the upcoming federal supplemental appropriations bill. As Congress prepares to vote, we ask that you join other advocates of higher education in contacting your Representative and encouraging him or her to stop this round of massive layoffs in higher education, to stop the increase in class sizes, to stop the reductions in course offerings, and to vote to preserve quality higher education in our nation. In an open letter to Congress, AAUP general secretary Gary Rhoades details how a failure to invest in postsecondary educators could close the doors of opportunity on our students, would compromise our potential as a nation, and could sabotage the combined efforts of community, industry, and the government to recover from this economic downturn. Visit the Government Relations section of the AAUP Web site to learn more about how you can stand up for postsecondary faculty and staff. The AAUP Online is an electronic newsletter of the American Association of University Professors. Learn more about the AAUP. Visit us on Facebook. Follow us on Twitter. Contact us at govtrelations@aaup.org. East Michigan success, Minnesota frustration, California dreaming and serious speed bumps on Chicago's South Loop. Apropos the last, here is the latest from EWU (presumably Chicago, not to be confused with the Bangladesh for-profit, not yet anyway), forwarded by Joe Berry for posting to the public and blogged at the Adjunct Voice. East-West University (EWU) withdrew its petition to vote for a union. In a letter addressed one day before EWU administration received the National Labor Relations Board collective bargaining petition notice for adjuncts, Chancellor M. Wasiullah Khan informed all department chairs, full-time faculty, part-time faculty and staff that "no contract will be renewed this year effective the forthcoming summer session and the academic year beginning with Fall quarter 2010." The letter went on to point out that no department chair, full-time faculty, part-time faculty or staff member would be hired back "without first meeting with the Chancellor." Since, as far as I know, EWU Adjuncts don't have a home of their own on the web. there are welcome to camp out right here ~ and I bet with Raye too. Following the briefest of breaks between Apri/May events, summer brings forth yet another conference season. No rest for either wicked or weary. This particular season seems more profession, career and labor than academic discipline and pedagogy oriented ~ but still with workshops, panels, forums and such. Adjunct issues are increasingly represented too, just as they are at the major conferences for academic disciplines. Unless very close to home, attending conferences is hard on the adcon's limited budget but probably a necessary expense considering how much they expand networking opportunities for activists and advocates, all the more indispensable when there a campaigns or projects to promote, i.e. building membership in a new organization or the Unemployment Compensation Initiative. The first "post semester" conference, SUNY Stonybrook's How Class Works, was June 3-5. Maria Maisto hosted an active NFM Q & A session and Steve Street presented. Next, June 9-12, came the AAUP (American Association of University Professors) Conference in Washington, DC. 9-10, with adjunct sessions June 9-10. I probably have enough details on both Stonybrook and AAUP for separate posts, especially (hint, hint) if I hear from a few more participants. It's not just faculty out there on the conference trail: AAUP included sessions on administrative issues and at least one presentation by a longtime trainer of online "facilitators" at for-profit universities. Concurrently with the AAUP Annual Conference, the CCA (Career College Association) held its Annual Convention & Exposition, an adjunct issue free event, June 9-11, in Las Vegas and covered by Inside Higher Ed like any other conference. The Vegas venue is also popular with with K-12 administrators for meetings and workshops as well as with lawyers taking required professional development workshops. A very different conference, the U.S. Social Forum will take place June 22-26 at Detroit's Cobo Hall and at various locations throughout Detroit. The dramatic and symbolically charged difference makes a striking counterpoint. The forum is not an academic or exclusively academic labor conference and promises to be an event where working people from all walks of life can share stories and creative solutions to problems as they plan for social, economic and environmental change. The Union of Part-Time Faculty at Wayne State will host 'Adjuncts United' contingent during U.S. Social Forum's opening march June 22 and the "Voice for the Voiceless" workshop to discuss adjunct organizing efforts June 23. Check The Adjunct Voice and at AFT Face Talk. for more coverage, links, and contact details. Likewise, Owen Thomas is also reminding Open a Vein readers to head for Motor City. NFM board members Jen Bills will be there, others as well, so I'm hoping for follow-up good reports. Same time frame, June 22-July 6, the NEA Convention meets in New Orleans. The Representative Assembly (RA) takes place during the final four days of the Annual Meeting. Hinting again, dear readers, if you are attending, please drop me a line. Reports on any conferences with ad/con sessions would be most appreciated. I especially welcome state and regional conferences. I'll also be checking in on Twitter for conference updates. CMU adjuncts threatened with arrest!